It does not have to be hard to prepare bird food every day. If you use the correct storing methods you can do it in bulk and cut down your kitchen time a great deal. Once you get yourself a routine going it does become a lot easier. Storage containers are a must if you need to do a lot of fresh foods. If you get the right containers your food will last refrigerated for 1 week. 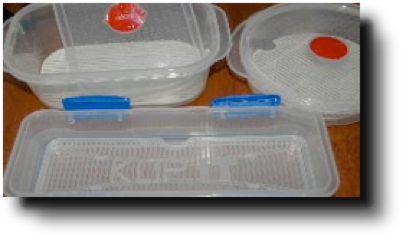 I use plastic containers with breathable holes in the lids and removable grates in the bottom. These sort of containers allow for the juices and liquids to settle to the bottom without letting the food touch it so it doesn't ferment in the juices and go off quickly. But regardless of how much longer than a week your fresh food is keeping, you should not keep it longer than a week as bacteria does grow quickly of fresh sprouts and fresh cut fruit and veg. Smaller grates in the bottom will cater for sprouted foods while the larger ones are suitable for fruit and veg mixes. For storing pellets it's best to keep them in their original packaging. Most of the packets have zip locks to seal the pellets in. The 100% natural pellets don't last as long so you need to keep an eye on them & make sure the zip locks are sealed properly at all times to keep the freshness in. Seeds can be kept in their original packaging as a long as you seal the opening properly. Unsealed packets will end up with weevils in them and you seed can go stale quickly. You can kill the weevils by placing your seed in the freezer. Some people opt for keeping their seed in the freezer all the time to keep weevils out and keep the seed fresh. 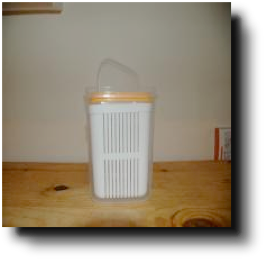 You can also place your seed in a sealed air tight container or jar to keep weevils out and keep seed fresh. Seed and pellets should be kept away from light and in a dark dry area or cupboard for freshness. 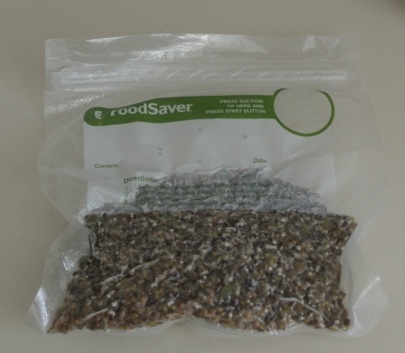 Another increasingly popular way to store prepared bird food is to package it and freeze it. This is done by people who’re very busy so they make bulk fruit and veg mixes as well as bulk sprouts. This does save on time. Some people package the freshly made food into meal size bags and freeze, then defrost just before use. Others find it harder to prevent their food going soggy with freezing and defrosting. The solution they have come up with this is to vacuum seal the food and freeze. A vacuum sealed bag will draw the moisture out by vacuuming, keeping it fresher. And it can be defrosted as needed and used. Vacuum sealed and freezed freshly made sprout packs.